1. 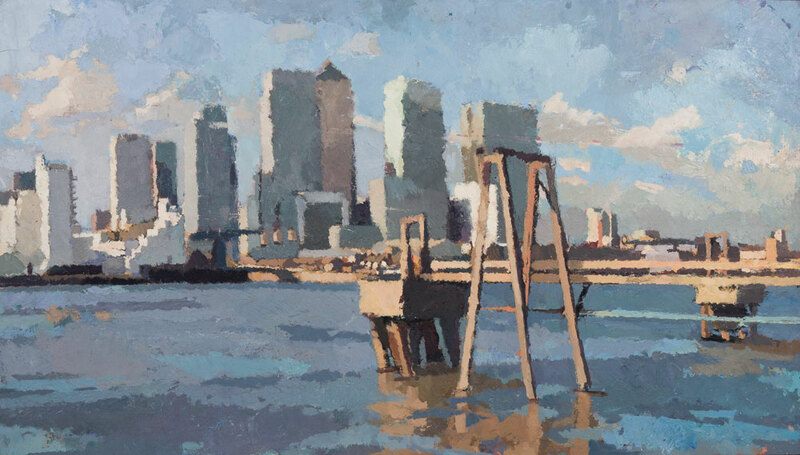 Canary Wharf, Evening (Victoria Deep Water Terminal). Oil on canvas. 2009-2014. 21x29.5 inches. £1,500. 2. 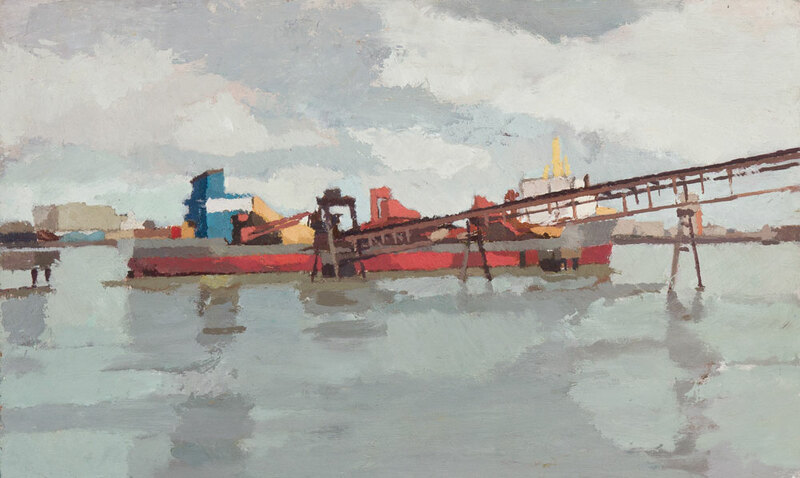 Dredger with gantry, Murphy’s Wharf, East Greenwich. Oil on canvas. 2014. 18x24.5 inches. £1,100. 3. 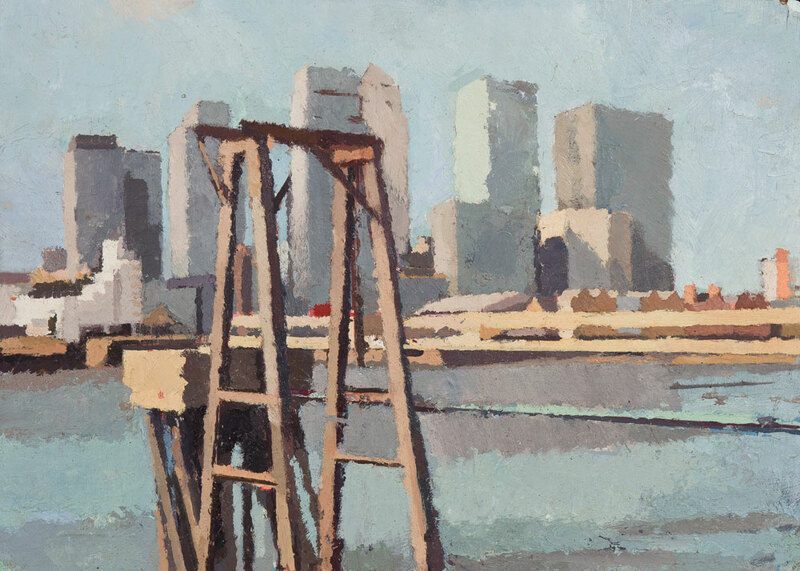 Canary Wharf with railings (Delta Wharf Greenwich). Oil on canvas. 2009-2014. 20x25 inches. £1,100. 4. Low Tide, Silvertown from the Ecology Park / Greenwich Yacht club at Greenwich peninsular, East Greenwich. Oil on board. 2009. 19.5x25 inches. £1,400. 5. Canary Wharf with gantry from Delta Wharf. Oil on board. 2010. 17x23.5 inches. £1,100. 6. High tide, Silvertown from the Ecology Park / Greenwich Yacht club at Greenwich peninsular, East Greenwich. Oil on board. 2009. 23.5x27.5 inches. £1,400. 7. 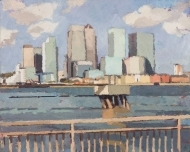 Canary Wharf with Pier (Delta Wharf Greenwich). Oil on board. 2009. 20x28 inches. £1,200. 8. 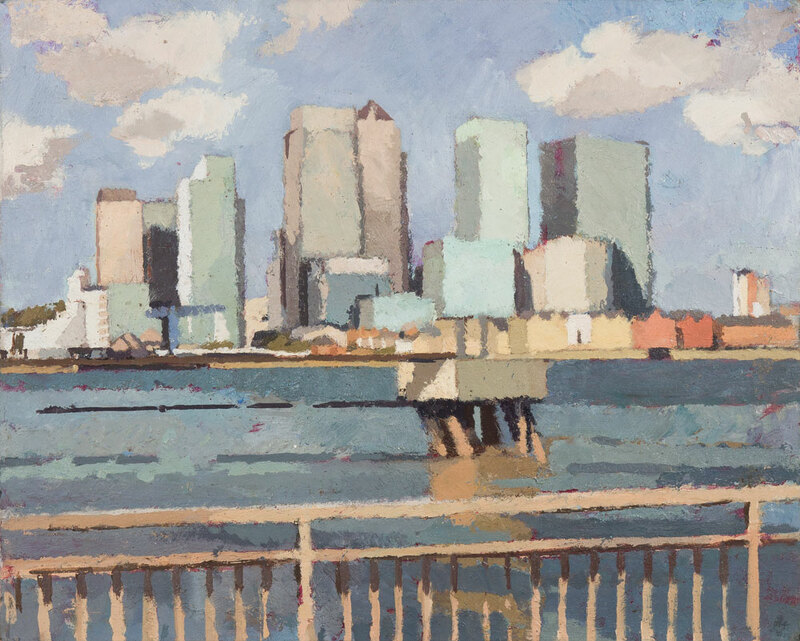 Blackwall reach from Lovell’s Wharf. Oil on canvas. 2009. 22x33 inches. £1,600. 9. Conveyor Belt, Woolwich, view west. Oil on board. 2014. 21.5x30 inches. £1,600. 10. Yellow Crane, Woolwich. Oil on canvas. 2014. 17.5x27 inches. £1,200. 11. 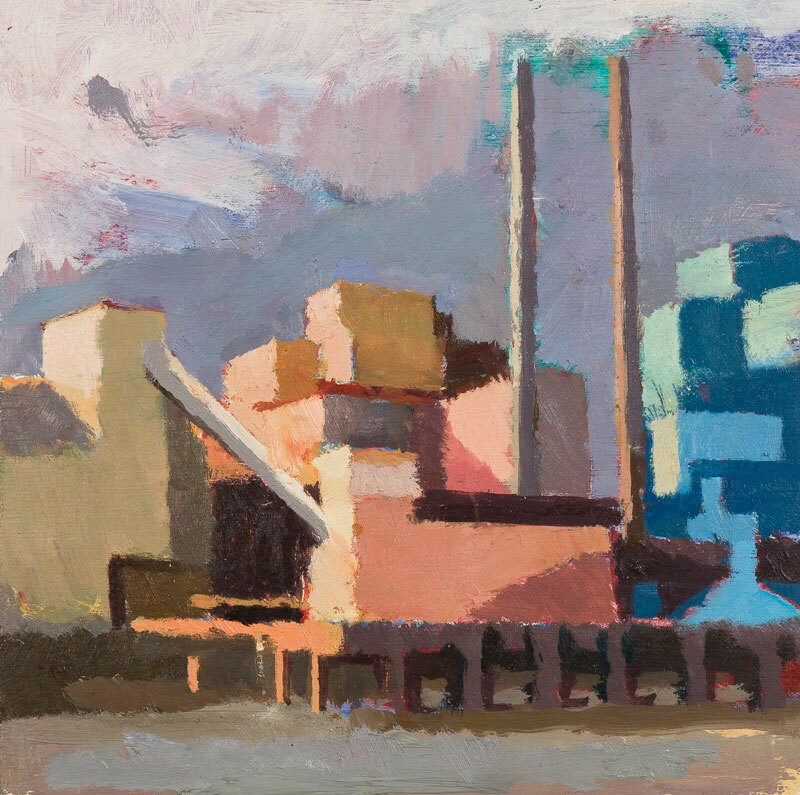 Tate and Lyle, North Woolwich from Second Floor Studios, near the Thames Barrier (Woolwich). Oil on canvas. 2014. 18x24 inches. £1,100. 12. Blue Cranes at Peppers Wharf, Greenwich I. Oil on canvas. 2009. 21.5x24.5 inches. £1,000. 13. 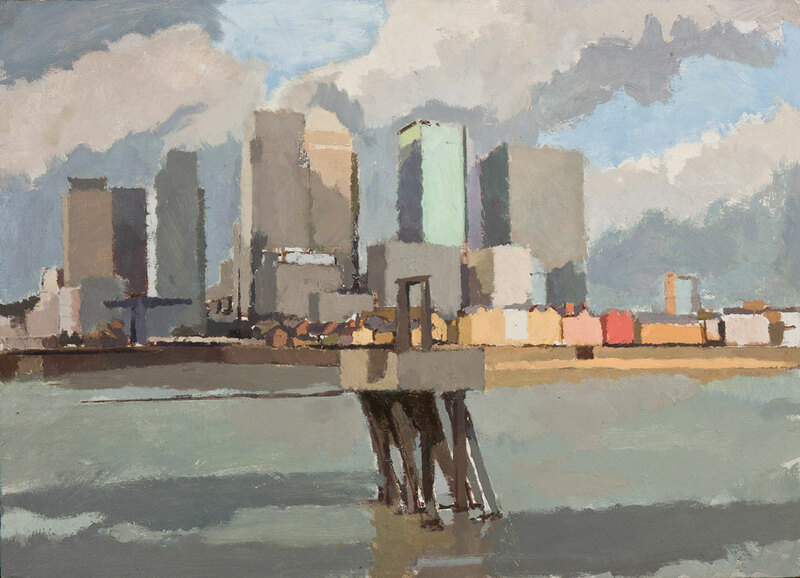 Canary Wharf, white sky (Delta Wharf Greenwich). Oil on board. 2009-2011. 15x25 inches. £1,000. 14. Dredger at Murphy’s Wharf, East Greenwich. Oil on board. 2012. 15x25 inches. £1,400. 15. 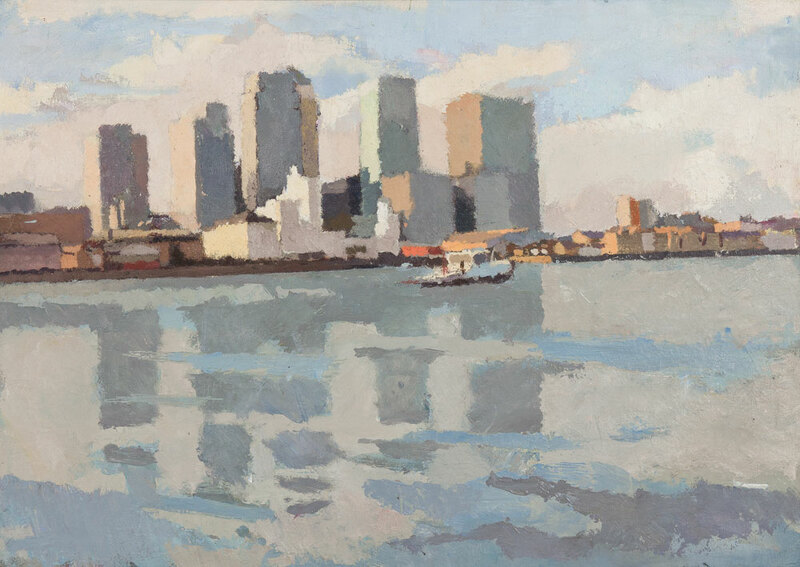 Canary Wharf from Delta wharf, Greenwich. Oil on board. 2009. 23.5x41 inches. £2,300. 16. Blue Cranes at Peppers Wharf, Greenwich II. Oil on canvas laid on board. 2009. 15.5x26 inches. £1,000. 17. 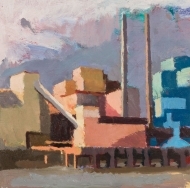 Tate and Lyle, North Woolwic from Second Floor Studios, near the Thames Barrier (Woolwich). Oil on board. 2014. 10.5x10.5 inches. £550. 18. 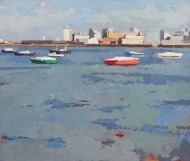 Blackwall Reach from Lovell’s Wharf. Oil on board. 2010. 12.5x22.5 inches. £900. 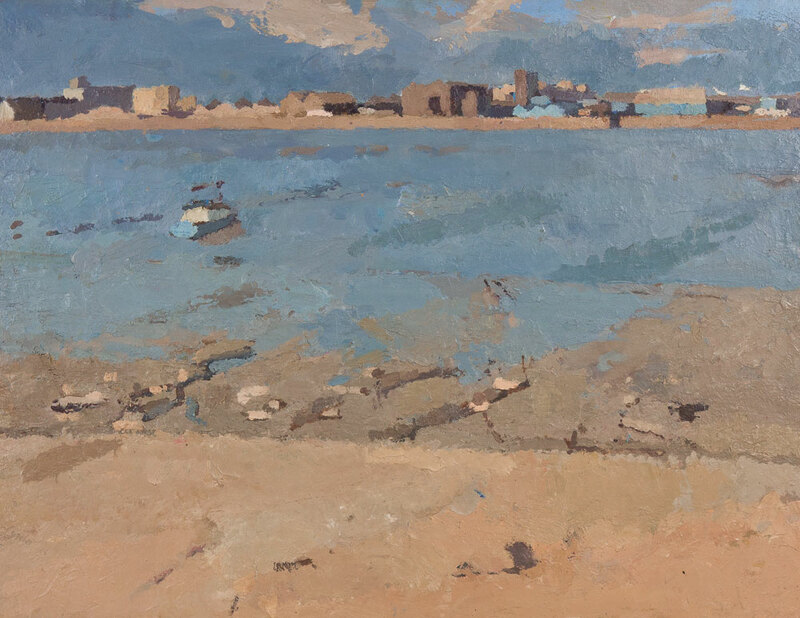 Alex Pemberton is a painter who relishes the appearance of things, the outdoors look of landscape painted on the spot, not reassembled like a jigsaw back in the studio. 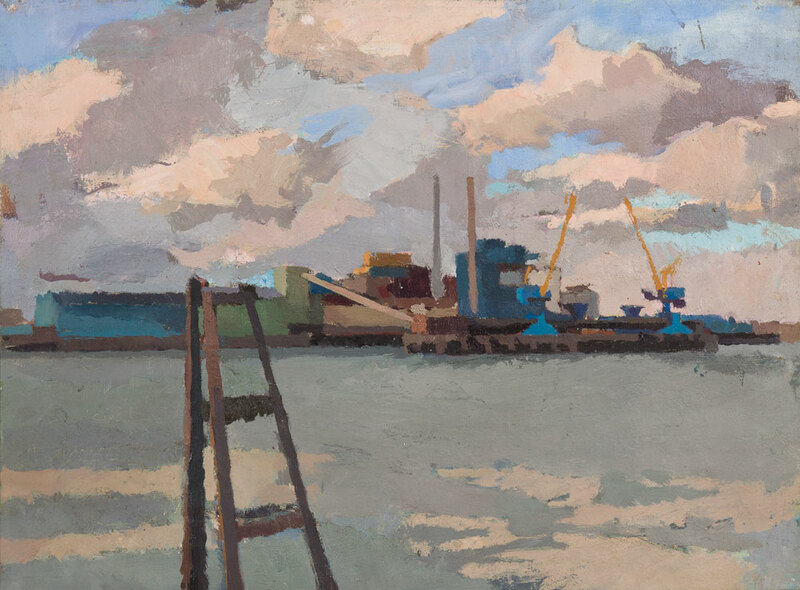 He derives the authority of his work from painting in front of the subject on Thames-side footpaths and other vantage points, and from struggling to turn paint into prospect while having the constant challenge of the actual view in front of him. Like a philosopher, he is seeking after truth, and unsparing in his scrutiny. 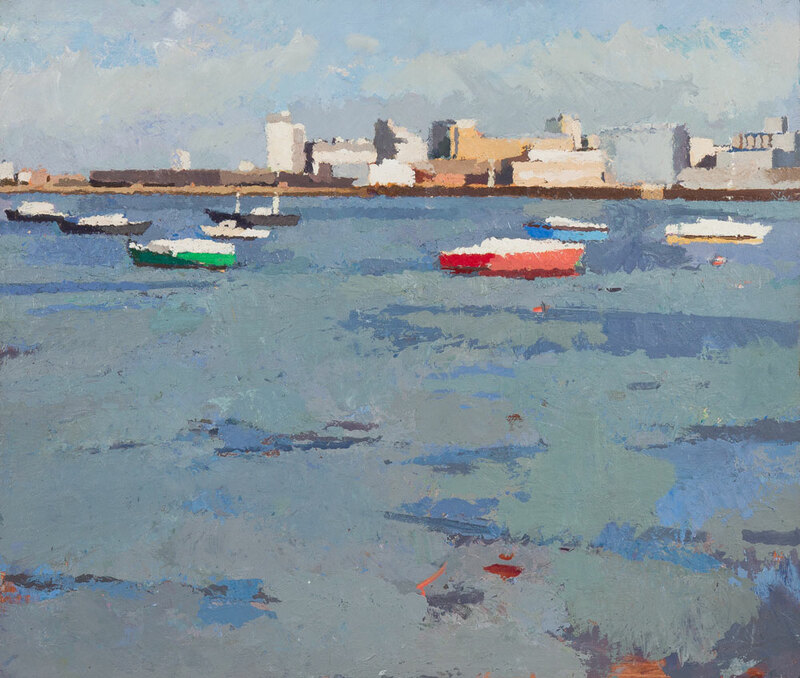 A central problem facing a realist painter who chooses the river for subject is articulating and making sense of a large plane of water. 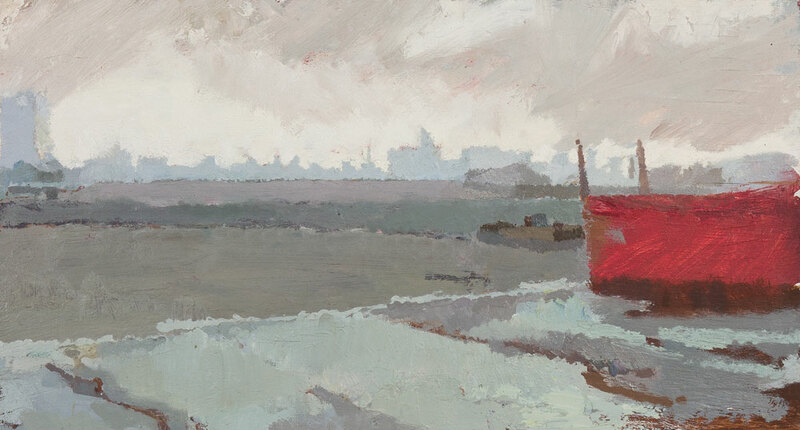 Pemberton manages to convey to the viewer a sense of travelling across it: not just in terms of looking, but in imagining the passage of a boat over it, so well does he make the scene real and vivid. If his ostensible aim is the pursuit of objectivity, his actual achievement is thankfully greater than this: warmer and altogether more human and emotionally rewarding. He is immensely self-critical, but his high standards pay off in the absence of rhetoric in his work, the refreshing lack of easy flourishes. 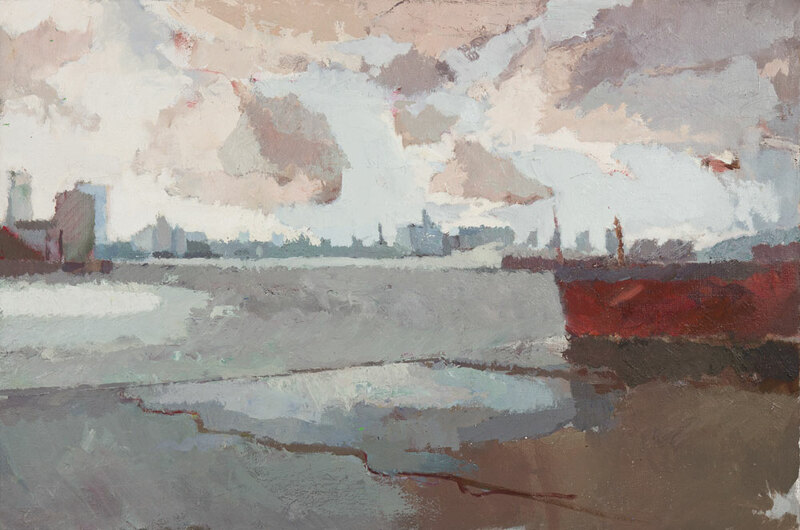 He habitually paints a stretch of the river around North Woolwich, and over the years has registered many changes in the skyline as developers move in on deserted industrial sites. The Boat Club has moved, silos have gone, housing proliferates. 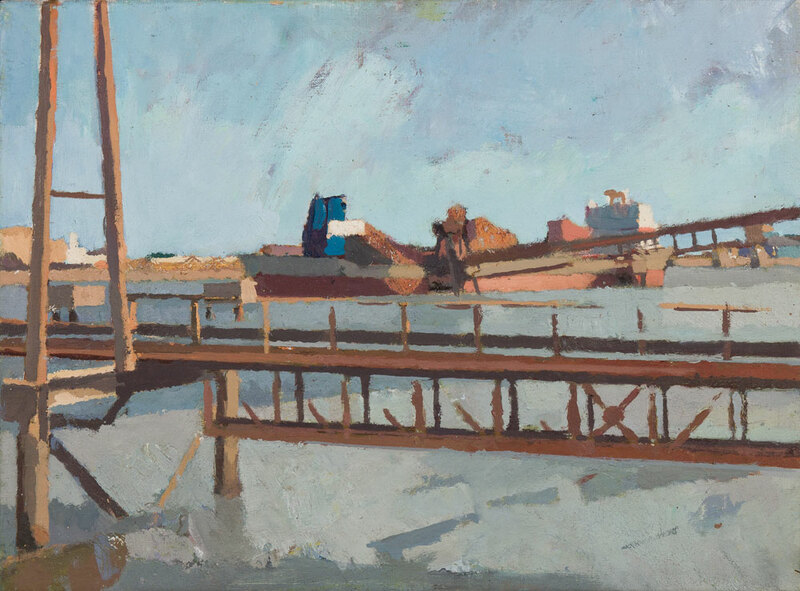 Anthony Eyton has called Pemberton’s paintings ‘deliberate and distilled’. Certainly, Pemberton has looked long and hard at his own work, and in thinking about ways and means, has returned to such great masters of the past as Corot. 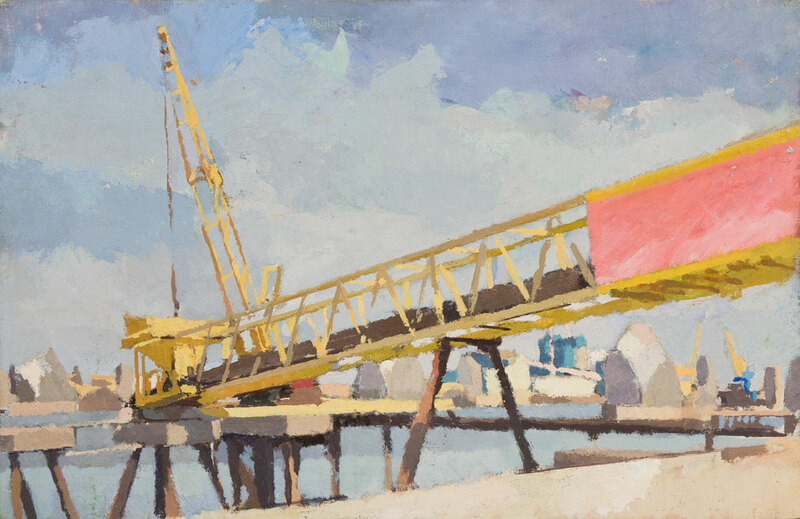 A long-term influence has been Nicolas de Stael, feeding a fascination for the materiality of paint surface. 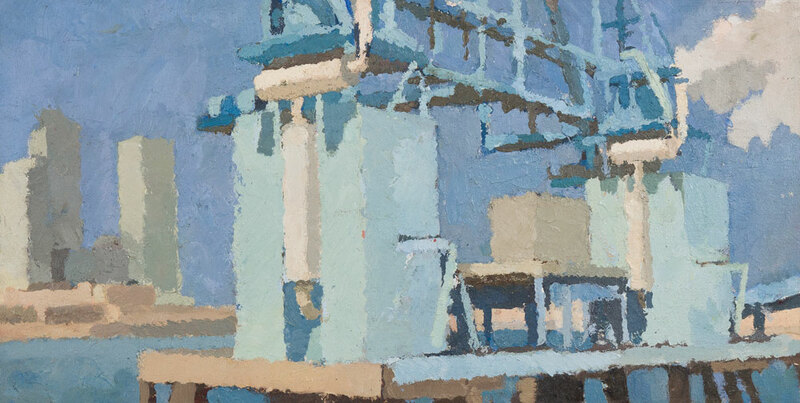 Morandi has been an inspiration for painting in series, and for formalizing a subject in close tones. 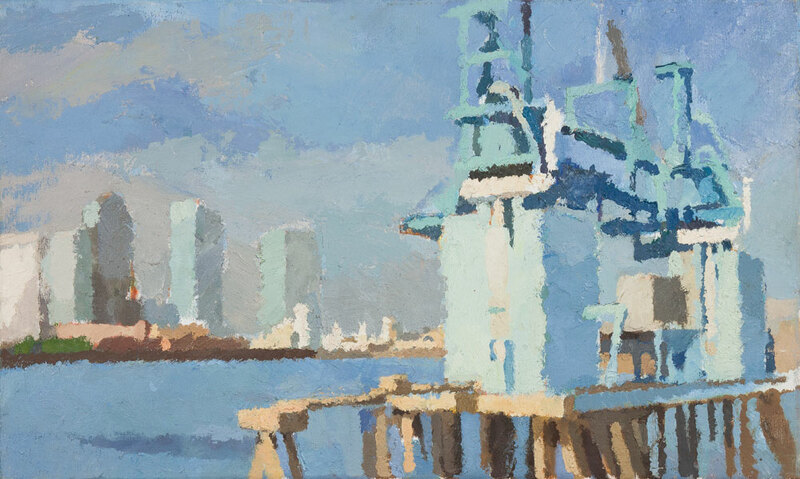 (Compare, for instance, Pemberton’s series of paintings of dockside cranes, which look almost like studies in blue, so close-toned is the colour; yet the impact is effectively sculptural). 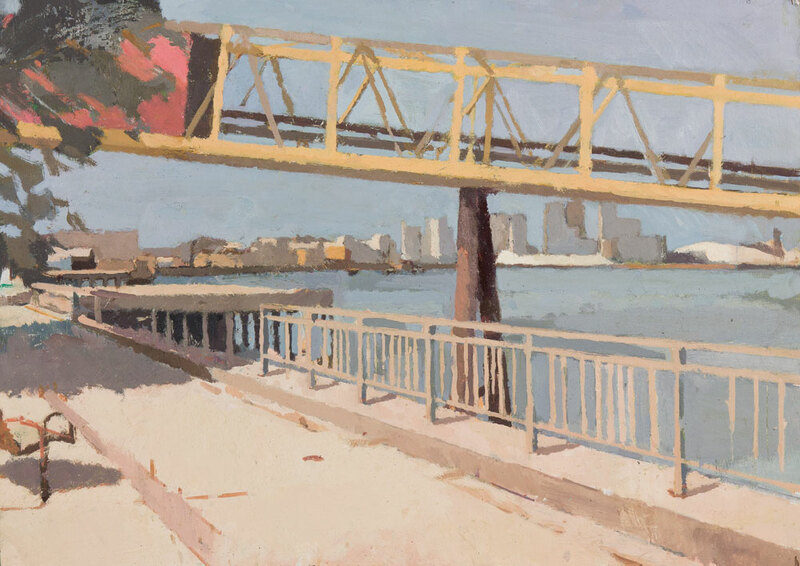 These paintings balance intriguingly between the panoramic and the intently focused. In the background rises Canary Wharf and the Isle of Dogs. The river, seeking its own truths, flows on. ‘The River’ Exhibition Catalogue, River & Rowing Museum, Henley.